As North Carolina teachers go out on strike tomorrow, they will be joined by the ranks of the state’s construction unions. Much like teachers, who lack the right to collective bargaining in the state, construction workers employed on North Carolina’s state-funded projects, such as schools, lack the ability to have their wages set by union-endorsed prevailing wage standards. They say the lack of collective bargaining rights for public employees in North Carolina is symptomatic of how the state also undervalues all workers employed on projects financed on the public’s dime. While construction workers in other states enjoy the benefits of prevailing wage standards, construction workers in North Carolina do not. Under prevailing wage standards, contractors are forced to pay the median wage that construction workers are paid in that region as determined by a government survey–the idea being that government-funded projects are supposed to keep wages from falling. “Prevailing wage levels the playing field,” says Thrower. Without a prevailing wage, contractors on state-funded projects can simply pay their workers whatever they want. While unionized electrical contractors in the state, working on federally funded projects that use prevailing wage standards, make a minimum of $25 an hour with retirement and health care benefits, non-union electrical contractors work on state-funded projects that often pay as little as $15-$20 per hour due to the lack of prevailing wage standards on state-funded projects. Worse, union leaders say the lack of prevailing wage standards negatively affects high road contractors, who use higher training and safety standards. Often unionized contractors, which offer a 4-year apprentice training program, find themselves at a disadvantage in competing against the “lowest” responsible bidders– many of whose workers have only gone through bare bones 9-week community college certification programs in North Carolina and have no state standards on what they are forced to pay their workers. Without prevailing wage standards, construction union leaders say construction work is often done by low-wage workers without years of expertise and safety training. In Arizona, construction workers also marched in solidarity with striking school teachers. According to Dean Wine, secretary-treasurer of the AFL-CIO and business manager of IBEW Local 460, some electricians on school construction sites are making as little as $12 an hour. “We hear a lot of horror stories about electrical installations [in schools],” says Wine. The role of construction unions in protest against Arizona and North Carolina serves to highlight the growing alliance between construction unions and America’s teachers’ unions. 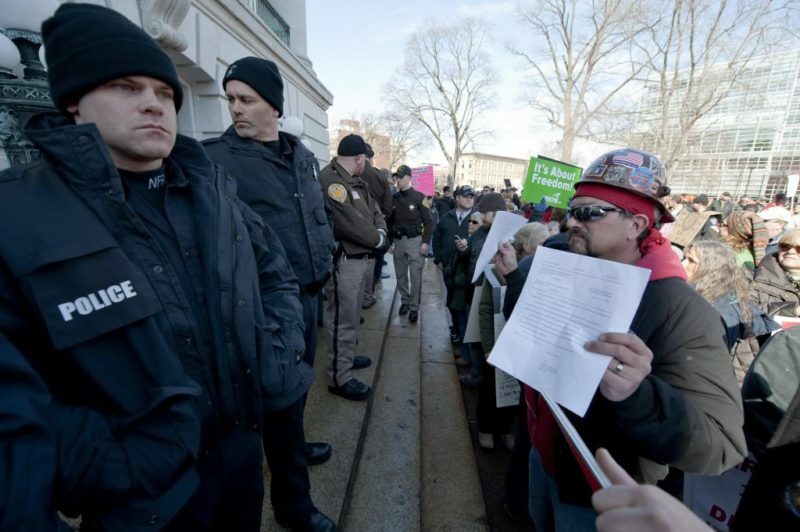 “Unions in Arizona [and elsewhere] see what happened in Wisconsin. 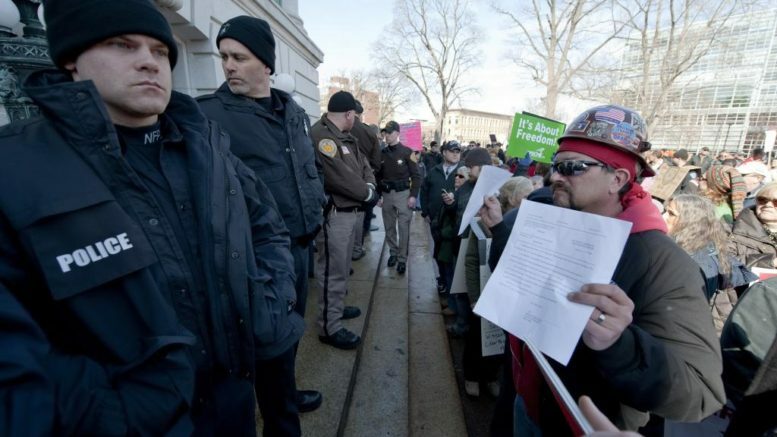 First, they come for the public sector unions, and then they come for you,” says Randy Bryce, who, as the former political director of Ironworkers Local 8, testified against the repeal of prevailing wage in Wisconsin in 2017, nearly 6 years after the state stripped collective bargaining rights from public employees. Since the beginning of the Great Recession, West Virginia, Wisconsin, Indiana, and Kentucky have all moved to cut prevailing wage laws while also passing legislation making their states “right-to-work” and rolling back collective bargaining rights. In 2012, Michigan also went “right-to-work” and now the state’s GOP majority is working hard to repeal prevailing wages standards. Anti-union legislators in those states have claimed that paying construction workers top wages leads to overly expensive projects. However, studies have repeatedly shown that repealing prevailing wage laws does not save money. Indeed, 75 percent of all peer-reviewed research articles published since 2000 show that repealing prevailing wage standards has no effect on bringing down construction costs. This is due to the fact that labor costs only account for 23 percent of the total cost of most major construction projects. Moreover higher wages can lead contractors to attract higher skilled workers, who can often save companies in terms of increased productivity. Since the late 1970s, more than 20 states have moved to repeal their prevailing wage, leading to a stagnation of construction wages as real construction wages are lower today than they were in 1970, according to an analysis conducted by the Economic Policy Institute. “The so-called savings that results are simply a myth,” says Matt Szollosi, executive director of the Affiliated Construction Trades of Union, whose state repealed prevailing wage standards on school construction projects in 1999. “There are no savings achieved on overall project costs, simply increases in the profit margins for contractors seeking to undercut the area’s standards of wages and benefits for working people,” says Szollosi. A 2017 study conducted by the Economic Policy Institute shows that construction workers in the states without prevailing wage laws on state-funded projects make 21 percent less than workers in states with prevailing wages. While construction workers in states with prevailing wage make on average $22.52 an hour, workers in states without prevailing wage standards make only $18.47 an hour. However, the threat of repealing prevailing wage laws has proven a motivating factor for workers in key swing seats. In the recent high profile Pennsylvania 18th Congressional District special election, organized labor campaigned hard against Republican Rick Saccone, who favored repealing Pennsylvania’s prevailing wage law. Union leaders bombarded their members with thousands of phone calls and mailers informing them of Saccone’s opposition to prevailing wage laws, contributing to Democrat Conor Lamb’s narrow 755-vote victory over Saccone in a district that previously had voted for Trump by 17 percent. “It was easy to motivate our members because they repealed prevailing wage in [nearby] West Virginia and they understood what was at stake,” says Keystone Mountain Lakes Regional Carpenters Council union representative Mike Welsh. For many construction workers, prevailing wage standards are dear to their heart as they know the difference in their take-home pay when they work on a federal project with prevailing wage standards versus a state-funded project without prevailing wages. Donate to Payday to Help Us Keep Covering the Fight for Prevailing Wage. Be the first to comment on "Construction Unions Ally with Striking Teachers to Fight for Prevailing Wage Laws"